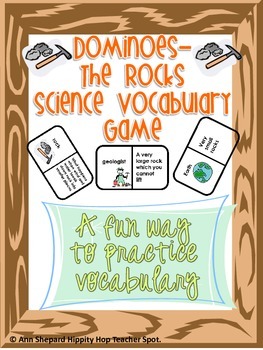 Looking for ways for students to practice their science vocabulary? 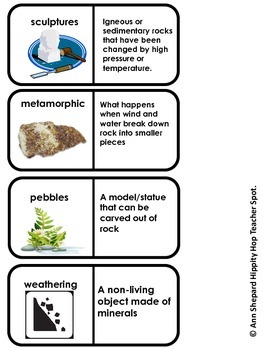 This is a vocabulary dominoes game on the topic of rocks. 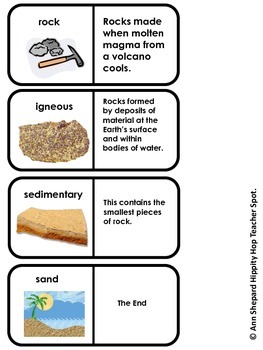 *****The following vocabulary words are used: geologist, rock, weathering, igneous rocks, metamorphic rocks, sedimentary rocks, sand, pebbles, sculpture, Earth, and boulder. * answer keys for the game and for the printable. This would be great for independent work, homework practice, partner work, centers, extra practice for ESL students, or an activity to use if have a substitute teacher. If the above vocabulary words fit your class' needs, this would be good practice. 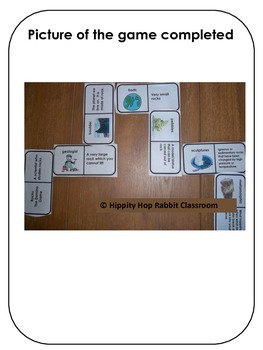 If you have questions before purchasing or after, please contact me at hippityhoprabbitclassroom@gmail.com.